I have had people ask me how I transition from holiday to holiday so quickly. I have also had people ask me where I store all of my holiday stuff. 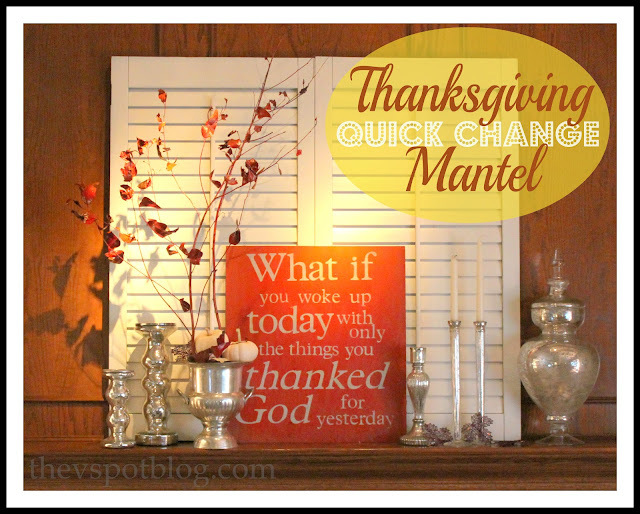 This Thanksgiving mantel took about 5 minutes (not counting drying time) to switch from a Halloween theme to ready for Thanksgiving. Here are the two looks. Here’s how. See the the black sticks and branches in the silver champagne bucket on the left…? I plucked them out of there and sprayed them with a nutmeg color, then immediately with Krylon Burgundy Spray Paint. I actually had a paint can in each hand. It created kind of a cool ombre effect. 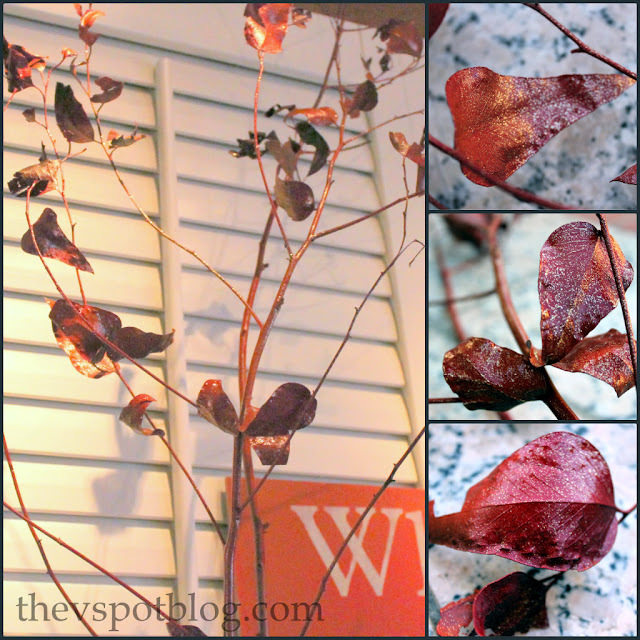 Then I sprayed the branches with hair spray for a little bit of shimmer. 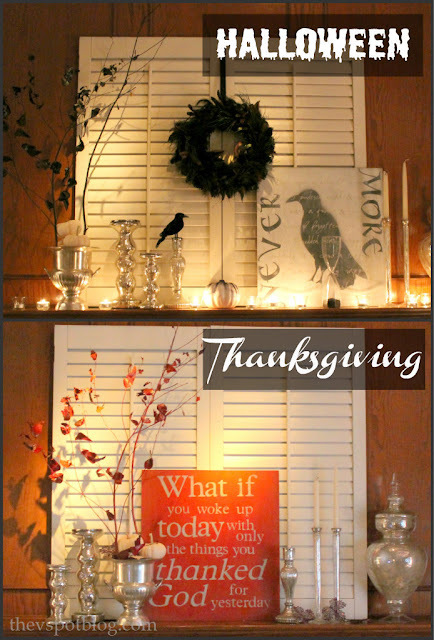 So while the leaves and branches were drying I took down the wreath on the shutters, got rid of the black items, and flipped over the Raven artwork to reveal the Thankful artwork on the other side. That’s right… the art is reversible for both Halloween and Thanksgiving. I just needed to flip it over. Having pieces that are interchangeable like this saves storage space and makes the transition between the holidays quick and easy. So yes… going from Halloween to Thanksgiving. Quick and easy. The sign idea is great! We have storage bins color coded for each holiday. However, garage space is limited so we’re trying not to bring in anything new. I’d love to make the sign! Oh good. I hoped this post was going to have some hairspray in it! I might have grabbed some for myself this weekend at Walmart for 75% off. Very nice quick change! I love it! Did you make your Thanksgiving board? Great message!!! I need to do an interchangeable thing for Halloween/Fall. Did you know that shimmers/golds and silvers are totally in for the holidays this year? Have you decided what your Christmas colors are yet?